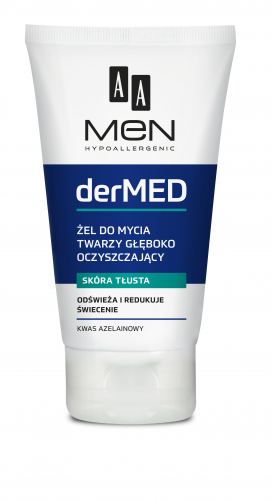 AA Men derMed is a specializde product line based on innovative dermocosmetic solutions. Formulas were developed for the most demending skin types to effectively care for the male skin, treating dermatological problems and restoring its healthy, antural appearance. Troxerutin together with the chestnut extract strengthen and improve the elasticity of blood vessel walls, protecting them from damage and therefore reducing redness of the skin. Aloe extract accelerates the skin regeneration process, strengthnes the natural protective mechanisms of the skin and additionally has a moisturizing properties. Provitamin B5 and allantoin soften irritations and have a soothing effect on the skin. Apply daily in the morning and evening to cleansed face. Aqua, Aloe Barbadensis Leaf Juice, Isodecyl Neopentanoate, Pentylene Glycol, Octocrylene, Dicaprylyl Carbonate, Paraffinum Liquidum, Arachidyl Alcohol, Coco-Caprylate/Caprate, Cetyl Alcohol, Behenyl Alcohol, Butyl Methoxydibenzoylmethane, Betaine, Palmitic Acid, Glucose, Panthenol, Ubiquinone, Anhydroxylitol, Xylitol, Sodium Lactate, Fructose, Urea, Allantoin, Sodium PCA, Arachidyl Glucoside, Xylitylglucoside, Aesculus Hippocastanum Seed Extract, Troxerutin, Trehalose, Sodium Hyaluronate, Tocopheryl Acetate, Inulin Lauryl Carbamate, Propylene Glycol, Borago Officinalis Seed Oil, Squalane, Carbomer, Decyl Glucoside, Glycerin, Sodium Chloride, Sodium Polyacrylate, Trideceth-6, Citric Acid, Maltose, Ethylhexyl Stearate, Sodium Hydroxide, Triethanolamine, Polyglyceryl-3 Caprate, Phenoxyethanol, Ethylhexylglycerin, Tocopherol, Potassium Sorbate, Sodium Benzoate.